Brandi Carlile On Practicing Forgiveness, Even When It's Hard "It's a really radical and ugly, difficult process that, you know, great beauty comes from." The folk singer discusses her new album, By The Way, I Forgive You, with NPR's Mary Louise Kelly. Brandi Carlile's By The Way, I Forgive You follows 2015's The Firewatcher's Daughter, nominated for best Americana album at the 2016 Grammys. Early in her career, Brandi Carlile bent and broke Americana and folk stereotypes as an openly gay woman with outspoken progressive politics. Leading up to the release of her latest album, she posted an open letter on Facebook to the Baptist pastor who refused to baptize her because of her sexuality when she was 15. She forgave him. At 36, Carlile has earned Grammy nominations and topped folk charts with a half-dozen critically acclaimed albums, many of which tackle personal topics from the singer's life. For her seventh studio release, By The Way, I Forgive You (out Feb. 16), she focused her songwriting on "radical forgiveness" — what she characterizes as an ugly but ultimately rewarding act, whose benefits can extend as much to those who were hurt as to those who did the hurting. Carlile spoke with NPR's Mary Louise Kelly about the journey that led to By The Way, I Forgive You. Hear their conversation at the audio link, and read an edited transcript below. Mary Louise Kelly: The topic of forgiveness is such a big thing to tackle. What made you decide to take it on? 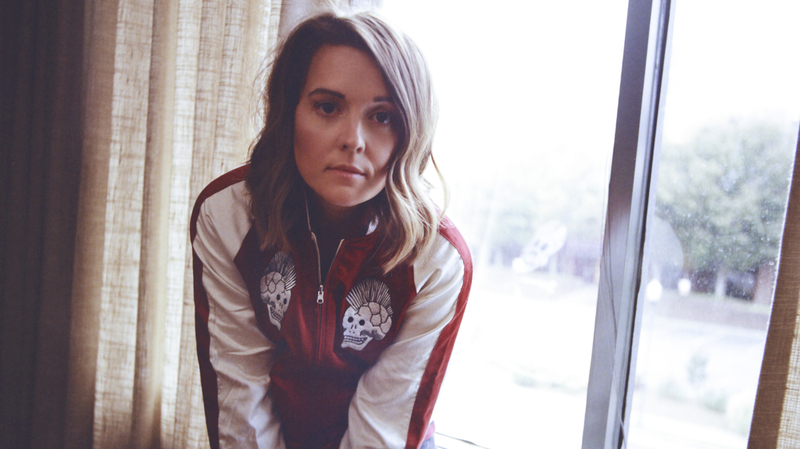 Brandi Carlile: Well, it kind of appeared out of my record, and my writing process, like a sculpture would appear when you take the pieces of stone away that don't belong: I didn't realize that that's what I was writing about until I was looking back on it. But it's a word that I think is kind of evangelicalized ... or glossed over by kind of a "hashtag blessed" way of looking at it. It's a really radical and ugly, difficult process that, you know, great beauty comes from. The song "Most Of All" is specifically about your connection to your parents. As you put it, parents can be your first love: You write, "If your parents are still alive, don't forget to tell them that you love them, and mean it." I watched both my parents lose their mothers last year. It was really interesting, because throughout the process of growing up, I listened to all of their grievances and gripes about their mamas, the things that kept them from answering the phone sometimes and all that stuff. And then as soon as those women were gone, it was like all memory of any of that immediately just evaporated, and it was all funny stories and good things. There are people that could criticize the way that we that we react towards our loved ones when they're gone, and say that we make them inhuman or perfect — but then, there is the argument to be made that suddenly we see things for real for the first time. You also write about the process of becoming a parent and how that's changed you. The first line of the song "The Mother" goes, "Welcome to the end of being alone inside your mind." [Laughs] It's so true, man. Curse it. Why? Because she's always in there with you, your daughter? Yeah. A woman called Trina Shoemaker, who engineered Bear Creek and The Firewatcher's Daughter — good friend of mine, really mystical crazy person — she told me when the baby was born, "Welcome to the end of being alone inside your mind. You'll never be alone in there again; there'll never be a day where you don't wake up wondering what Evangeline needs. Not when she's 50." And boy, is that the truth. How old is Evangeline now? She's going to be 4 in June. She's a little Gemini baby, like me. And what's her reaction to that song when you play it for her? She knows it's about her; she loves it. But any of the bad stuff, she doesn't associate to her. She asks me things like, "Mama, who is the lady in the song that trashed your car?" I'm like, you are the lady in the song that trashed my damn car. You took to social media recently and asked people to share stories of people they forgive, or wish they could forgive. And you told a story of your own about a pastor, Pastor Tim. Would you share it with us? Yeah. That whole campaign, by the way, shook me to the core, seeing the things that people are forgiving people for. I stopped reading it when I got to when that woman forgave someone that ran over her 7-year-old little girl. Forgiveness is so radical and so filthy, and it gets made out to be such a casual concept, when really it might be one of the deepest things that we do as humans — to forgive for real deep hurts. The one that you're talking about is a specific hurt to only me, but: I was young, and I was part of the church community in my small town. I had committed myself to baptism, and the pastor let me go through the process — you know, there's kind of a process part of getting baptized. Right — you have to meet with the pastor, do some Bible study. Yeah, and then your family and your friends come and they sit in the church and wait. And it's after hours — it's not on a church day — and you get dunked in the water, which I was always nervous about. I just remember walking to the church with my bathing suit on under my clothes, and getting there and seeing all my family in the seats ... and then, Pastor Tim telling me that he couldn't do it. But waiting until all that had happened. That he couldn't do it why? He couldn't do it because I was gay, and because I wouldn't say that I was going to change that or that I could change that. And he waited until you had your whole family and your friends and everybody there expecting this event to happen? He did. He called me for days and days afterwards begging for my forgiveness. He said that he struggled with it for so long that he just ran out of time, that he thought he was going to do it right up until the time, but he just couldn't. It took me a long time to forgive him and it threatened my faith; it threatened my self-worth. So I was like, "Well, if I'm asking other people to do it, I'm going to do it." So I did it and I felt weird about it, and I still feel weird about it, to be honest with you. Had you forgiven him right up to that moment where you started to go public and tell the story? I think I thought I had. But there is a publicness, actually, that almost has to take part in the forgiveness thing. It's not a neoliberal, disenfranchised thing that you can do by yourself quietly in a room. I think you really have to do it, and it feels weird. The first track released from the album, "The Joke," has a moment where you talk to a little girl and say, "You get discouraged, don't you, girl? It's your brother's world for a while longer." How come? Oh, you know, the marches and the protests that I was part of last fall and winter, seeing the little girls with all their Hillary Clinton swag and all their belief that in their time they were going to see a woman have the audacity to lead something like the United States of America. And then seeing that defeatist look in their eyes and all of the messaging after the fact was heartbreaking. Is there a political message that runs throughout this work, or is this more your coming to terms with the struggles you've got going on in your own life? It certainly is throughout the whole thing. But I think that people are feeling politics more personally than they've ever felt them before. And it's not just because of the sensationalism or because of the exposure those things are getting — I think in America our politics are particularly personal. We tend to spend a little bit more time on social issues than other people do, and we have a long way to go in terms of social justice. So when I sing about politics, it's intertwined with my marriage, which couldn't have happened just a number of years ago. You're married to a woman and that wouldn't have been legal a generation ago. And my child wouldn't exist if not for the changes that we've seen politically in our landscape. So for me, politics get really personal, and it's certainly worth singing about. In the liner notes for this album, most of the songs have long pieces of writing attached to them — paragraph after paragraph. For the song "Hold Out Your Hand," you have one sentence: "Sometimes when the weight of the world feels too much, I want to dance with a redneck and shotgun a beer." I envy you with this song, because when I get to that place where the weight of the world feels like too much, I'm stuck shotgunning a beer. You get to belt out a song like this one. It must be liberating to sing that way. Oh yeah, it really is. I love people so much, you know? I love people that don't think the same way I think, and I do want to hold out my hand and be joined to other people that are different than me, at the end of the day. ... I'll probably shotgun a beer with you, though, sometime. You've said your philosophy for a long time had been to save everything dramatic and traumatic for when you're live, not when you're in the studio recording. You threw that away with this album: There is drama and trauma and everything else going on here. What changed? Well, [producer] Dave Cobb just wasn't having that. He wanted to challenge my belief that there is a way to do things live and a way to do things when you're making a record. And it's hard to challenge your beliefs when you're a little ways into making records, but Dave believes that if there's something that you would do live — if there's a chance or a risk that you would take — that you should do it in the studio more than anywhere, because it's a document of what you would really spontaneously do, instead of this kind of perfect, contrived, packaged version. It really changed the way I would do things. [Until now], I finished a record and then it's time for rehearsals, and like the first thing I do is go, "OK, how can we change everything?" "Now we can do double that guitar solo." "Come on, let's do an outro." "You know what, I'm not going to sing this chorus — I'm gonna scream it, because it's live." And Dave was just offended by the concept that I would wait until after doing something so permanent to take those risks. On this record, you will hear me screaming and hollering at the top of my lungs. Four-minute outros. We cut our first fade on this record, where we actually don't ever stop playing ... and it made me feel like Elton John. It's deep and it's about filthy, ugly, difficult radical forgiveness, but it's also fun. It was really fun.